“I don’t necessarily make bird houses for birds to live in|! !|” says Tommy Myers. The fruits of Tommy Myer’s labor are spread around the country — from his son’s place in Dallas to backyards across Acadiana — but a remembrance of each remains in his Eunice woodshop. For 15 years, ever since Hurricane Lily wiped out his men’s clothing store business in Eunice, pushing him into early retirement, Myers has cataloged every birdhouse he has created. Each entry contains a photo accompanied by a paragraph-long write up. As he flips through the pages — 1,898 of them at last count — Myers rattles off theme after theme: church birdhouses, a golf one, a wine-themed house, a Wizard of Oz-motif, a military inspired house and even a cool jazz one with a brass horn stuck to the roof. There’s really something for everyone, he says. As long as you’re not a bird. Myers’ endeavor (originally titled, “Birds of Pray” because the first phase of houses resembled churches) has morphed from a hobby inspired by the hefty price tag attached to many of the birdhouses his wife, Lou Ella, collected into one of the most unique and talked-about kiosks on the south Louisiana art show and festival scene. 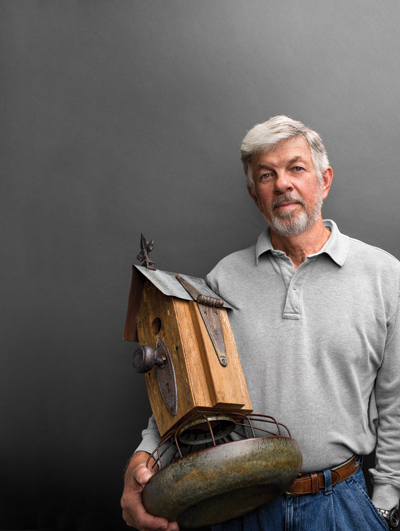 The eye-catching elements of Myers’ birdhouses — a hodgepodge of stuff scattered around most garages — attract passersby, piquing their curiosity. Still, Myers understands the disconnect of many potential buyers, and even one seller. A couple years ago, Myers set up shop at an art show next to another vendor selling no frills, traditional birdhouses. The neighbor asked Myers the price on his custom houses and Myers answered $75. The plain ones next door were going for $25 and selling at a much faster clip. Then, the vendor asked Myers how long it took to make these fancy pieces? About a day, on average, he replied. The vendor laughed. This is art, not economics. The task is to make memories, not money. Though he’ll occasionally accept commissioned orders, Myers much prefers the buyer to separate themselves from the artistic process. The less information or input the better. He believes the vision the buyer creates with a description probably won’t match the product he or she sees and touches in the end. In fact, Myers’ policy on commissioned work is if the customer doesn’t like the finished product, they don’t have to purchase it — the artist confident enough to believe someone else eventually will. “I had a lady ask, ‘Can you make a carpenter (themed) one?’ and I said, ‘Yes, if you stop right there.’ I don’t want the creativity to be mapped out beforehand,” Myers says. “My wife and I have a good understanding, she stays out of my shop and I stay out of the kitchen. If I throw in my two cents, the meal might not taste as good, and if she throws in her opinion, well, I just can’t think the way she thinks. The creativity just has to come. Really, finding the rusted nuggets and discarded gems that will eventfully turn a standard birdhouse into a bird home, is without a doubt the most enjoyable part of the building process. It’s arguably the most creative element, too. Every item — whether buried in a bin or collecting dust on a shelf — could be the figurative light bulb for another Myers piece. There is a method to Myers’ perceived junk-pile madness, evident from cornucopia of public reactions toward the finished products.